That's fine for those passengers and for the tourist industry of Norway but I don't like the cold or ice and snow. Lucky for me I got to see an impressive display of the Northern Lights in September 1990, when I was doing the coastal voyage aboard the Kong Olav. Almost 700 people from Great Britain on this cruise. To see the Northern Light is their main goal. Oh wow!!! My kind of ships. Not my kind of weather conditions though. 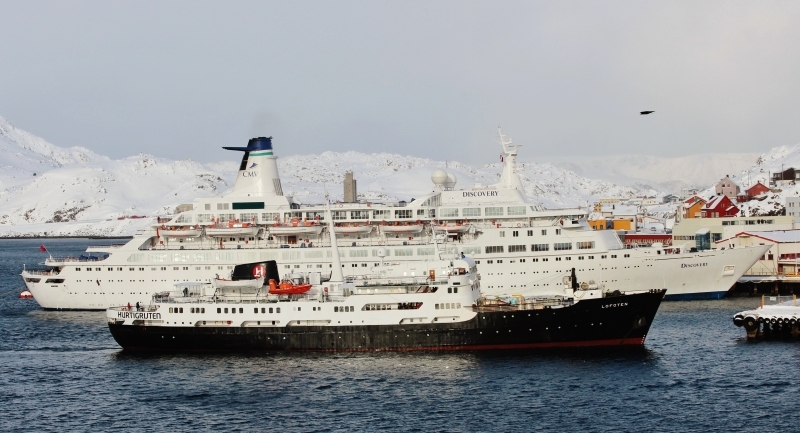 Why anyone would want to go off on a cruise to northern Norway in the winter leaves me utterly bewildered. an excellent comparison panorama of two now classic vessels! mrdot.